Francis GRISWOLD (1610 -1652 ) was Alex’s 11th Great Grandfather, one of 4,096 in this generation of the Shaw line. Francis Griswold was born about 1610 in Kenilworth, Warwickshire, England. His parents may have been George Henry GRISWOLD (bapt. 6 Nov 1574 at Wootten Wawen Warwickshire- 1623) and Dousabel LEIGH (1575 – 1615) Francis married Mary [__?__]. Francis died in 1652 in Cambridge, Mass. Many sites have perpetuated the error that Dorothy James married a George Greswold and had various children who came to America. The available records do not support this. Dorothy James married Henry Greswold in Belbroughton, Warwickshire in 1592. They did have a son George (as well as Humphrey and William). However, George was only about 13 years old (i.e., born ca 1588) when his father died in 1601/02. George died about 1615. George was presumably unmarried as no mention is made of a wife or children and all of his property (including Greet Hill) went to his brother Humphrey. His father was born in 1563 (his mother, Dorothy, is reputed to have been born about 1567 and died in 1656). Thus they could not have had a son George born in 1548. Mary [__?__] was born about 1617 in Kenilworth, Warwickshire, England. After Francis died, she married William Bullard on 4 Jan 1653/54 in Cambridge, Middlesex , Massachusetts. Mary died in 1685 in Cambridge, Mass. Alternatively, Mary died 2 Oct 1652 in Charlestown, Mass. William Bullard was born about 1594 in Barnham, Suffolk, England. His parents were William BULLARD and Grace BIGNETT. On 16 May 1610 in Barnham, Suffolk, England, he was mentioned in the will of William Bullard. In 1630 in Barham, Suffolk, England, he was mentioned in the will of Grace Bignett. William Bullard immigrated in 1638 to Massachusetts Bay Colony. He settled in Dedham, Mass. He lived in 1658 in Charlestown, Suffolk, Massachusetts. He moved in 1677 to Dedham, Norfolk County, Massachusetts. William died on Monday, 23 Dec 1686 in Dedham, Norfolk, Massachusetts. 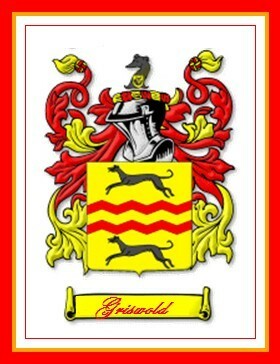 Often this name is spelled Grissell, Grisill, Grisold, Greshold, and Greshould. Many sites state that Francis immigrated with his brother Matthew, but I’m thinking Matthew belonged to a different family. It looks like Francis lived in Cambridge, Mass and brothers Matthew and Edward Griswold immigrated to Connecticut, and are assoicated with Saybrook, Norwich and Killingworth, Connecticut, called then “Kenilworth,” in honor of the Griswold’s native place in England. Jonah PALMER lived in Charlestown, Mass which is only three miles from Cambridge before his family moved to Rehoboth in 1643 so he might have known Elizabeth as a child, but she would have been only 7 or 8 years old when the Palmer family left for Rehoboth. Our Francis and Mary had no male children and hence few rearchers into their true English origins. On the other hand, maybe GEORGE GRISWOLD of Kenilworth, England, had five sons born there. MICHAEL, b. 1597; settled Wethersfield, Conn.
EDWARD, b. 1607; settled Windsor, Conn., 1639, Killingworth, 1664. FRANCIS, b. _____; settled . Cambridge, Mass. MATTHEW, b. 1620; settled Windsor and Lyme, Conn. [Salisbury Genealogy, Vol. II, p. 5]. Adding to the confusion, Edward named one of his sons Francis Griswold (1629 – 1671). here is a mystery whether our not Mary Griswold married William Bullard after our Francis died. There is another mystery whether or not the widow of the other Francis Griswold married Major William Bradford. John9, John8, John7, John6, John5, William vel Thomas4, Richard3, Ralph (Rudolphus)2, John1), son of Roger10 GRESWOLD, was christened on 6 Nov. 1574 in Wooten Wawen, Warwickshire and died between 1613 and 1633. He married about 1606, DOUSABEL LEIGH? , who was born about 1575, was buried on 28 Aug. 1615 in Wooten Wawen. The George Greswold mentioned in the eleventh generation in the Visitation of Warwickshire, 1619, may be the father of Edward Griswold, who emigrated from Kenilworth, England, to Windsor, Conn. in 1639. It is clear from a deposition made by Captain George Griswold that the great grandfather’s name was George Griswold, who had three sons, Edward, Matthew and Thomas. There is thus the possibility that George Griswold, father of Edward and Matthew, is to be identified with the George Griswold of the eleventh generation. Edward Griswold, born in England, about 1607. He married there about 1630, Margaret, whose parentage is unknown. Actual records of his birth and marriage have not been found. One source researching the Griswold Genealogy, Captain George Griswold indicates that Edward’s parents were George Griswold (baptised 6 Nov 1574 at Wooten Wawen) and Dousabel, whose maiden name was thought to be Leigh. The Griswold Family Association in America has done extensive research and believes that George Griswold is the father of Edward. Sadly, the Kenilworth parish records prior to 1630, which might have settled the question, were destroyed during the wars of the Commonwealth, and the Griswold family in England has become extinct. Matthew Griswold was born in 1620 at England. He was the son of George Griswold and Honora Pawley. Matthew Griswold married Anna Wolcott, daughter of Henry Wolcott Sr. and Elizabeth Saunders, on 16 October 1646 at Windsor, Hartford Co., CT. Matthew Griswold died on 27 September 1698 at Saybrook, Middlesex Co., CT.
Matthew came to Windsor in 1639 with Edward Griswold, his older half brother, and the congregation of the Rev. Ephraim Huit, but did not remain there long. He became an agent of Lord Fenwick and moved to Saybrook where he received a grant of land in 1645 which became the foundation of a large fortune. Old Lyme was first settled in 1664 as East Saybrook, and Matthew as the pioneer and its first settler. He was one of the signers of the Articles of Separation in 1665. Although Matthew was a lawyer, he also followed the trade of a mason, furnishing the stones for many of the graves of the early settlers. He also furnished the stone for his father-in-law, Henry Wolcott, which is almost intact after all these years. However, there is no stone for Matthew’s grave, nor do we know exaclty where he is buried, although there are are records which would lead one to believe that he is probably buried in the Old Saybrook Cemetery. Although he removed to Lyme, he remained a member of the Saybrook church and was brought there for interment. The terrible consequences of the witchcraft delusion and the opportunity which it provided for the poor and unscrupulous members of the community to harass people of wealth and character cannot be better illustrated than by the following account, although the outcome was more fortunate than for some. In 1667 John Tillerson charged the wife of Mathew Griswold of Lyme with being a witch and induced others to suspect her of witchcraft, for which Matthew caused him to be arrested and arraigned before the court. This John stated the cause of his suspicions and jealousies. The court decided that she was not a witch and that he had no cause to be jealous of her; that he had greatly sinned in harboring such jealousy against so good a neighbor who had done him so many favors. To clear Mrs. Griswold of all suspicion of the offense the Court ordered that its opinion should be published by the constables at Saybrook and Lyme at some public meeting. Anna was living in September 1700 when she and Abraham Bronson were summoned before the court at New London as adminstrators of the estate of Matthew. Abraham was summoned alone to the court in May 1701, so Anna evidently died in the interim. The birth sequence of the children is from Vol. II:122 of the Middletown Congregational Church records, but the Frenches suspect a discrepancy. The Frenches cited the following sources: Town and church records of Lyme, Middletown and Saybrook, Ct; Wolcott Memorial; Connecticut Colony Records Vols. I, II; Historical Society Collections, Particular Court Records; Court of Assistants Records, Office Secretary of State. This entry was posted in 13th Generation, Immigrant - England, Immigrant Coat of Arms, Line - Shaw, Witch Trials and tagged Cambridge. Bookmark the permalink.